Nick is a highly experienced rehabilitation and sports trainer who owns a training facility in Melbourne, Australia. With over 11 years in the Health & Fitness industry specializing in difficult injuries and health concerns he has built up a reputable business both in Australia and internationally. 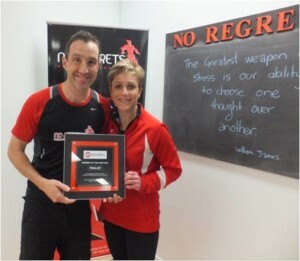 His business No Regrets Personal Training has won several business awards for excellence in 2012 & 2013 and Nick has also been a featured expert for Women’s Health & Fitness Magazine and on National TV in Australia. Nick’s qualifications are varied with certifications in Pilates (Mat & Reformer), Accredited Lift For Life Disease & Disability trainer, Level 2 Sports Conditioning Coach and even an accredited Tai Chi instructor. But the main focus of his work and health method is based on the CHEK Institute programs where Nick is a qualified CHEK Exercise Coach, Level 2 Holistic Lifestyle Coach and Golf Bio-mechanic Coach. The CHEK method makes up a big part of the training style used to provide the ultimate health and wellness experience for his clients. An approach of Health before fitness and a movement approach to exercise has proven to be highly successful with all ages and abilities. We look for the underlying causes of disease and stress, considering the body as a system of systems and design programs accordingly. With regards to exercise our method is all about improving the body’s efficiency at performing key movement patterns such as push, pull, twist, lunge, squat and bend & walking. All of which improve a person’s function for life, work and even in the sports environment. Deficiencies in any of these movements will increase the chance of injury and lead to undeveloped motor skills and ultimately poor performance. Not just a bookworm, Nick has been a highly successful athlete himself for his entire life and has played at high levels in basketball, tennis and more recently triathlon, distance running and cycling. A real passion for exercise, and sports, has made it easy for Nick to teach people the skills and lessons he has used himself for a long time on how to become and remain healthy. In 2015 due to the overwhelming success and popularity of Nick’s website articles and You Tube videos he put together an Online Shop with a series of detailed education DVD’s and books for particular injuries that he and his team were helping people in Melbourne to overcome and rehabilitate. This has led to the program now being sold all over the world and giving people the opportunity to heal and prevent injuries using Nick’s unique movement based approach to training. The type of clients Nick now works with vary from professional elite athletes, to working with stroke patients and spinal pathologies to group programs for older adults. And in 2016 we launched a new program for disease management, a specific program for Cancer patients receiving treatment. Having teamed up with a local Oncologist and several Health Practitioners in the area the No Regrets facility has gained a strong reputation for providing great programs for these specific areas in the community needing help.